An interesting blue or purple mineral which occurs in a fibrous state. It is mostly used for the production of high temperature ceramics. This stone occurs around the world, in a range of countries. It is an aluminium based boro silicate, similar to Kyanite – which is also blue, and also used in the manufacture of ceramics. 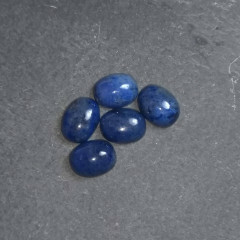 It has been sold by less scrupulous sellers as Sodalite or Lapis Lazuli – and it is understandable how the untrained eye could be mistaken, when the stone is polished. Even the larger crystal structures of the stone could be mistaken if the colour is right. It is sometimes referred to as ‘Dumortierite Quartz’, but this is an inaccurate name. Dumortierite Quartz specifically refers to pieces of Quartz with inclusions of Dumortierite. These pieces are quite desirable to collectors, as blue Quartz is surprisingly rare, despite the commonness of Quartz itself. Dark blue pieces are the most common – usually with patches of other colours, light blue or grey being the second most common. It is a hard mineral, and can be cut for jewellery – although limited knowledge of the stone and the rarity of high quality pieces mean cabochons etc can be quite hard to find. 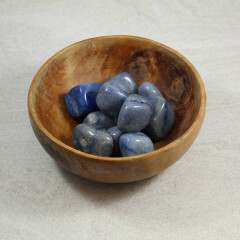 It is said that this stone helps you take control of your life, and teaches you patience with yourself. It is thought to be stimulating to the mind, and to help with learning mathematics and languages – it may be useful for students, or those who have to learn a new skill, or study for a test.